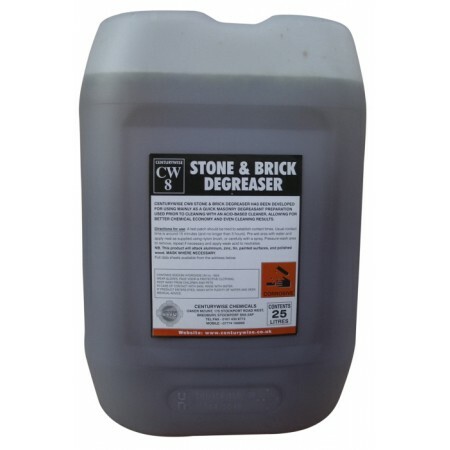 Centurywise CW8 stone and brick degreaser has been developed for using mainly as a fast acting masonry degreasant preparation used prior to cleaning with an acid based cleaner, allowing for optimum chemical economy and even cleaning results. Centurywise CW8 is a dark brown alkaline solution capable of penetrating, dissolving and removing greasy and oily dirt deposits. APPLICATIONS A test patch should be carried out to establish contact times. Usual contact time is approx. 15 minutes (and no longer than 3 hours). Pre-wet area with water and apply neat as supplied usinga nylon brush or carefully with a low pressure spray. Pressure wash area at minimum 1000 PSI to remove. Repeat if necessary, and apply weak acid to neutralize. NB. This product will attack aluminium, zinc, tin, painted surfaces, and polished wood...........MASK WITH PLASTIC SHEETING WHERE NECESSARY. CAUTION CW8 contains sodium hydroxide. Wear suitable gloves, eye/face protection and protective clothing. Read CW8 Health & Safety data sheets before using this product.